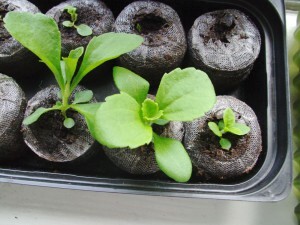 According to the internet, it’s pretty rare to find seeds for stevia as they are difficult to propogate. I planted up the 12 peat pods that came in the growing kit with 2 seeds in each. I have just three thriving plants. Four other pods have seedlings in but they don’t seem to be growing much. Two more have the tiniest hints of green showing but they’re not quite getting to the seedling stage let alone growing into plants. The three plants that are growing seem to be doing pretty well. The roots are starting to appear at the edge of the peat pods so they are nearly ready to move up into pots. Two of these needed thinning out, and the plants I removed provided an opportunity to have a quick taste. The tiny leaves tasted very pleasant, quite sweet and almost syrupy. I’m looking forward to having enough leaves to experiment with.